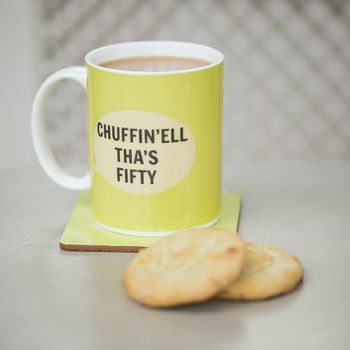 A gorgeous fine bone china mug in retro sunshine yellow, featuring the regional quote ‘Chuffin’ell Tha’s Fifty’. This retro sunshine yellow fine bone china mug featuring regional dialect is the perfect gift to celebrate a loved one who is turning 50! It is a truly original present that will have the recipient smiling and laughing every time they make a brew. The mug is shipped in a sturdy, made to fit box so as not to ruin the beautiful quality in transit.